The AFC Championship Game was the seventh in a row that the Patriots played in, the Jaguars were in the playoffs for the first time in several years. Both of those statements were apparent during the critical junctures of the game, especially at the end of the first half and late in the game. When all was said and done, the Patriots made the plays that they needed to make. Tom Brady showed once again, why he is Tom Brady and was absolutely brilliant in the fourth quarter, passing for almost as many yards at crunch time in the final quarter as Jacksonville allows in an entire game. The Pats made the big plays at the big times because Bill Belichick is simply the best in the world at preparing his team and being aware of situational football scenarios and handling them like a 7-7 practice and not in a conference championship. Jacksonville did none of those things. They cracked under the pressure, like so many teams do when playing the Patriots because they simply don’t make many mistakes and will rip your heart out when you do. The idea that the officials “gave this game to New England” is ridiculous. The Jaguars were up 14-3 and lost a key third-down conversion at midfield with a chance to put further distance between New England and themselves at halftime by taking a delay of the game penalty AFTER calling a timeout. On the ensuing drive an obvious helmet-to-helmet hit and a needless shoving of a wide receiver out of bounds when the corner had body position. Watch the replay, the flag doesn’t come until the shove. 47 yards in penalties to Tom Brady before the half is a recipe for disaster. In the second half, their play calling, so sharp in the first half go repetitive and predictable where they followed the same pattern. And the Patriots defense caught on and stuffed them in the fourth quarter. And after playing man in the first half, the defense, the top defense in the league got conservative and laid back in zones trying to stop the big play. Zone coverage against Brady is a recipe for going home early. All of the hand-wringing over Tom Brady’s hand and his subsequent 12-stitches proved to be much ado about nothing which we said but were ignored in our pregame matchups. He was cool, calm and was at his best with the game on the line. Brady put those worries to rest on the second play from scrimmage when he uncorked a seed for 31 yards to Brandin Cooks. His third and 18 throw to Danny Amendola was another rocket where the Jaguars were helpless to stop it. Then down by 10 points with six minutes left, Brady ripped the Jaguars apart. Once he saw them going to those soft zone coverages to protect against the deep ball, the handwriting was on the wall. He found Amendola twice in those six minutes for scores. The game-winning touchdown pass was a beautiful throw, high across the back of the back of the end zone where only Amendola could catch it. Both made great plays to make it work. Dion Lewis wasn’t nearly the factor in this game that he has been down the stretch gaining only a total of 66 yards, with 34 on the ground and 32 more thru the air. The Jaguars front seven did a great job of not only giving he and the other backs precious little room to run, they wrapped up well too, limiting his yards after contact, an area where he has been outstanding. Neither James White nor Rex Burkhead had a big day production wise as well. Big credit has to go to the Jaguars defense for shutting them down, especially in the passing game, an area that their defense has struggled in and the Patriots thought they could exploit. What more can we say about Danny Amendola? The Patriots wide receiver with the best hands on the team was once again at his best on Sunday, catching both of Tom Brady’s touchdowns in the late game comeback. The game-winner was a beauty as he read the coverage got open in the back of the end zone and had to make a high leap with a great catch and had the awareness to get both feet down. 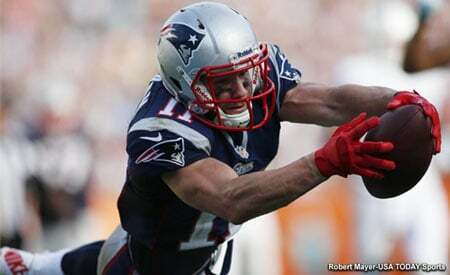 He also caught the ball that turned the game around, a 21-yard strike from Brady on a third and 18. He knew where the sticks were, and gave himself room to come back to the ball finding the open spot in the zone. He caught a backward pass and launched a 20-yard strike to Dion Lewis but Miles Jack jarred the ball loose for a fumble. Brandin Cooks had a big day catching six passes for 100 yards and drew two defensive pass interference penalties totaling another 68 yards. But he had a terrible drop that cost the team points, perhaps even a touchdown. Phillip Dorsett played in only 3 snaps but had a huge 31-yard reception on a nicely thrown ball and an equally good catch. Rob Gronkowski was double covered early in the game before the coaches began to find ways of getting him open. He caught a really nice 21-yard pass down the seam and when Brady attempted to hit again deep down the field in the final minute and a half in the second quarter, Barry Church leveled him with a helmet to helmet hit while attempting to jar the ball loose. Was it a dirty, targeted hit? No, but it was a penalty and the conspiracy theorists claiming it wasn’t are crazy. It was a clear helmet to helmet collision and intent has nothing to do with whether it was a penalty or not. Dwayne Allen came on and was invisible until the Patriots final series. He threw a nice block on Dion Lewis’ game-clinching 18-yard run to seal the game. The Patriots offensive line had an up and down day but they got better, especially at protecting Tom Brady as the game wore on and kept the Jacksonville pass rush for the most part off of Brady. They allowed three sacks, but one was a coverage sack where Dante Fowler had the time to put a second move on Cam Fleming spinning sway and finally sacking Brady. Shaq Mason gave up a sack from Marcel Dareus, who bulled right past him and nearly another when he whiffed on a Myles Jack A-Gap blitz. The run blocking on Sunday wasn’t opening any holes for the backs to exploit. The Jaguars front seven stuffed the run all day…until Lewis iced it. This group led by DE Trey Flowers keeps getting better and better and doesn’t get nearly enough credit for playing solid football. Flowers just gets better as the game moves along, his conditioning and relentlessness are contagious for the group. He made nine tackles with a sack, a forced fumble and a tipped pass he nearly picked off. The interior three linemen, Lawrence Guy, Ricky Jean Francois and Malcom Brown were excellent against the run holding Leonard Fournette and the Jags rushing attack to just 3.1 yards per carry. They shut down the run in the second half and ramped up the QB pressure on Blake Bortles. The unit had both good and bad moments during the game. Kyle Van Noy was solid throughout, notching a sack and a pass defensed but was trucked by Fournette on his touchdown run. James Harrison was solid in the running game and he combined on a sack late on Bortles and jarred the ball loose. But the Jags got the faster Corey Grant isolated on him in the passing game and they got a big chunk play of 20+ yards. Elandon Roberts was on the field for much of the base looks in run support while Marquis Flowers saw his snaps dwindle this week as the coaches decided to go bigger with Fournette in the mix. The unit had trouble getting their drops in tune with the secondary as the shallow crossers of the Jags gave them fits all day. Cornerback Stephon Gilmore had the play of the game and may have saved the season when he launched himself high in the air and knocked away Jacksonville’s final gasp on fourth down that sealed the deal. Dede Westbrook was in perfect position to haul in the pass at about the eight-yard line, He nearly had a pick earlier in the second half, but couldn’t come up with the ball. The Jaguars consistently gave the corners fits with those shallow crossers that they couldn’t stop. All three corners were beaten on those. Malcolm Butler had good and bad moments, he was battling with Marqise Lee which was a highlight of the joint practices back in August. Eric Rowe got roasted on a big 20+-yard chunk play from Allen Hurns who had him all discombobulated. He also gave up another big one to Corey Grant. But they tightened up in the second half. Rowe, too, nearly had a pick. Devin McCourty was his normally solid self and made a few key tackles. Pat Chung was very good in run support but got caught in no man’s land on Marcedes Lewis’ 4-yard touchdown. Bortles had a run-pass option and rolled to his right where Eric Lee charged in. Chung was caught not knowing how to proceed and Bortles flipped the ball easily over to Lewis for the score. The game plan was to stop the run and force the ball into Bortles’ hands. They accomplished the first part but the second? Allowing nearly 300 yards wasn’t part of the plan. The Patriots Special Teams were a very underrated reason why they were able to come away with a victory. Lost in all the silly hysteria over the penalty calls, was the stellar day by Ryan Allen. Allen dropped three punts inside the 20-yard line and didn’t have one of his six on the day returned. Because of the STs, the Patriots pinned Jacksonville on their last four drives no further out than the 16-yard line with the other three at either the 10 or 9-yard lines. After pinning the Jags deep, Danny Amendola, already having a day for himself returned a punt from midfield, 20 yards to the Jacksonville 30. Stephen Gostkowski was good on a field goal and all three PATs but once again it was his kickoffs that pin the opponent’s deep. And teams keep taking the cheese, running out the ball from 1-3 yards deep in the end zone and the coverage units led by Matthew Slater keep making them pay. Bill Belichick showed why he’s the master at clock management and situational football and his opponent was not. No one practices those type of scenarios more than the Patriots. And it shows… time after time, after time. The adjustments made after halftime was good both offensively and defensively although the Jaguars helped by playing scared. Jacksonville played man coverage and did a great job in the first half. In the second, once Josh McDaniels began to empty the playbook, the Jaguars, afraid of giving up a big play, went to a zone. Brady eats zone coverage like candy….er avocado ice cream. And it wasn’t if it was going to happen (comeback) but when. The Patriots coaches earned their pay by making the adjustments on offense, defense and special teams and the Jags did not. And decided to sit on a 10-point lead. Bad move. This entry was posted in 2017 Patriots Postseason, NFL Commentary, Patriots Commentary, Patriots News and tagged 2017 Patriots Season, Allen Hurns, Bill Belichick, Blake Bortles, Danny Amendola, Doug Marrone, Jacksonville Jaguars, Leonard Fournette, Malcolm Butler, Marcel Dareus, Marqise Lee, Myles Jack, New England Patriots, NFL, Patriots, Patriots edge rushers, Rob Gronkowski, Tom Brady, Trey Flowers on January 24, 2018 by Steve Balestrieri. 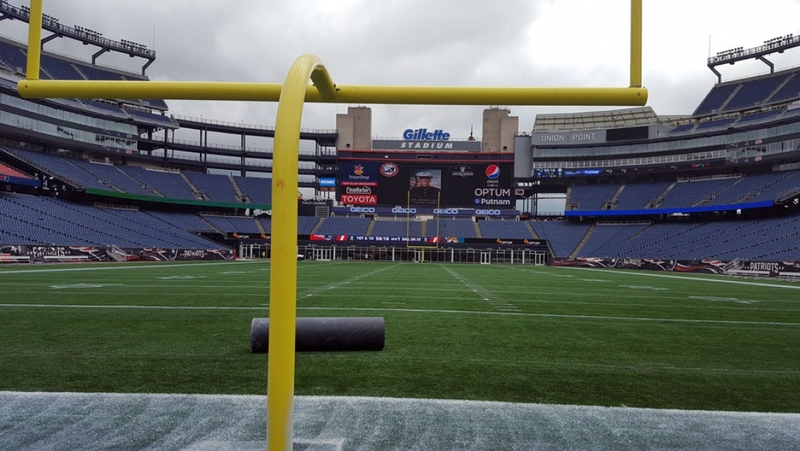 The long wait since the Super Bowl is over, the field at Gillette has the goalposts back up, the lines are painted on the turf and the Patriots will once again take the field for a football game. But don’t call it meaningless, because there remains a lot to accomplish. OK, we get that the final score of tonight’s game is secondary to both Bill Belichick and Doug Marrone but for the 90 players on the roster, many of them are fighting for jobs. And the coaching staffs will attempt to find those depth players and those valuable guys who fill roles on the team that makes such a big difference during the course of a season. Many of the Patriots starters won’t play tonight, I don’t expect to see Tom Brady, Rob Gronkowski, Danny Amendola, Nate Solder or Mike Gillislee on the field for the Pats offense. So what are we looking for tonight from a New England perspective as the Patriots take on the Jaguars in the first game of the 2017 preseason? This will be a big storyline for the entire preseason and into the regular season. Gone are Rob Ninkovich, Jabaal Sheard, and Chris Long. Trey Flowers is the elder statesman in terms of time with the team. He, Kony Ealy along with rookies Deatrich Wise, Derek Rivers and Harvey Langi will be watched closely in their first game action this year. Wise has had a very good start to camp and seems to be much farther along in his development than was expected at this point. He’s shown to be explosive and has had good penetration from the edge and along the interior. Before people pile on Ealy (and there’s been a lot of it), something to keep in mind is that early in camp the team has asked him to do a lot of different things that he was never asked to do in Carolina. He’s played a lot inside and that is a new position for him. Rivers seems to be getting in sync a bit more in the last few days, it will be interesting to see how he fares in his first game action. Langi has been moved around by the coaches. They’re trying to see all the things he can do and look for him to play outside linebacker and down as a defensive end tonight. Jacksonville’s offensive line has a lot of issues right now. There are at least two starting spots wide open for competition. So this will be a good test for both teams to see how their players are coming along. We know that Jimmy G. hasn’t had the greatest camp, but he’s never been the best practice player for some reason although he’s fared better during the games. Well at least initially, he’ll be playing with some very good weapons. I would expect Brandin Cooks, Julian Edelman and Chris Hogan to play a series or two tonight. Coupled with Dwayne Allen at tight end, James White, Dion Lewis and Rex Burkhead coming out of the backfield, this will be a very good group to work with. I’d expect to see Garoppolo play most of if not all of the first half. He should be able to lead the Patriots offense and get the unit clicking, especially when the above-named players are taking the field. Things to look for in his play, his decision-making, his processing of what he sees in front of him and his ability to get the ball out quickly and accurately. 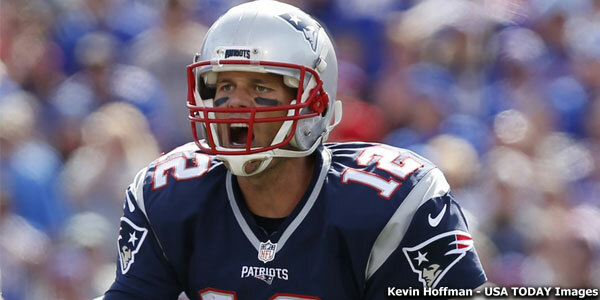 Many people thought that this was the year that he may push Tom Brady a bit for the reins to the offense. That hasn’t come close to happening yet. Brady is still head and shoulders far above him. But he must be ready to take over in a pinch and tonight we’ll be watching how he looks in the starting role. Thus far in camp, the Patriots corners, Stephon Gilmore, Malcolm Butler, Eric Rowe and Jonathan Jones have been very solid. They bring the physical element to the game and contest everything thrown at them. Rowe probably won’t play as he’s been dinged up a bit but that will still leave the other three to watch for the probably the first quarter. Jacksonville has some very good wide receivers in Allen Robinson, Marqise Lee and Allen Hurns with Marcedes Lewis at tight end but the problem with them has been getting them the football. The quarterback play in camp so far has been spotty at best and that’s what we saw in the two days of joint practices. Blake Bortles and Chad Henne were not doing a good enough job of getting their skill players the football during the 11-on-11 team drills. On the first day, they were a combined 8-22, on Day 2 they didn’t fare much better. With the largely vanilla schemes on defense in the preseason, the time may be right to see Bortles and Henne open things up a bit and see the field a bit better. In which case the Jaguars receivers will provide a solid first test for the Patriots secondary. But after what we’ve seen in the two practices, the Jags quarterback situation may preclude that. With LeGarrette Blount in Philadelphia now, the Patriots running game will definitely have a different look and feel to it in 2017. Gillislee has been slowed by a balky hamstring so I don’t expect to see him tonight. But the team has a lot of players who could see some significant snaps trying to earn a roster or practice squad slot. In the early going, I am intrigued to see how Rex Burkhead fares in his Patriots debut. He’s been an intriguing player to watch in camp as he brings the element of both running and catching to the mix. Dion Lewis looks back to full health and I’d expect the team to give him a few reps early in the game along with James White. But later in the game, D.J. Foster who is very quick out of the backfield is fighting for a roster spot. I’d look for him to get a ton of reps as the receiving back out of the backfield. Brandon Bolden who has gotten a lot of work with Gillislee on the shelf and LeShun Daniels will handle the heavy lifting in the running game between the tackles. Invariably during these preseason games, especially the early ones, a couple of the unheralded undrafted free agent players step to the forefront. It seems every year the Patriots have one UDFA who not only makes the roster but contributes some meaningful snaps during the season. We’ve already mentioned Langi above but the team has several to keep an eye on this week. Wide receiver Austin Carr has made some nice catches this summer and has struggled to get separation at times as well. He’s a guy to watch tonight. CB Kenny Moore has been around the ball making plays all summer, he and fellow rookie Will Likely are players to watch. TE Jacob Hollister is a move-tight end that has the speed to get separation and attack the seams, this may factor in later. Some of the players who have been on the team and are on the bubble this summer will bear watching. CB Justin Coleman, WR Devin Lucien who has had a strong camp thus far and CB/KR Cyrus Jones. Jones it should be noted, dropped his first kick of the summer and hasn’t had an issue since. He’ll be watched closely in Year 2 and much will be expected of him in the return game in 2017. It will be interesting to see how Patriots fans respond to Mark Brunell who does the color commentary for the Jaguars radio network tonight. Brunell had the famous crying jag (no pun intended) on ESPN after the news of Deflategate broke. 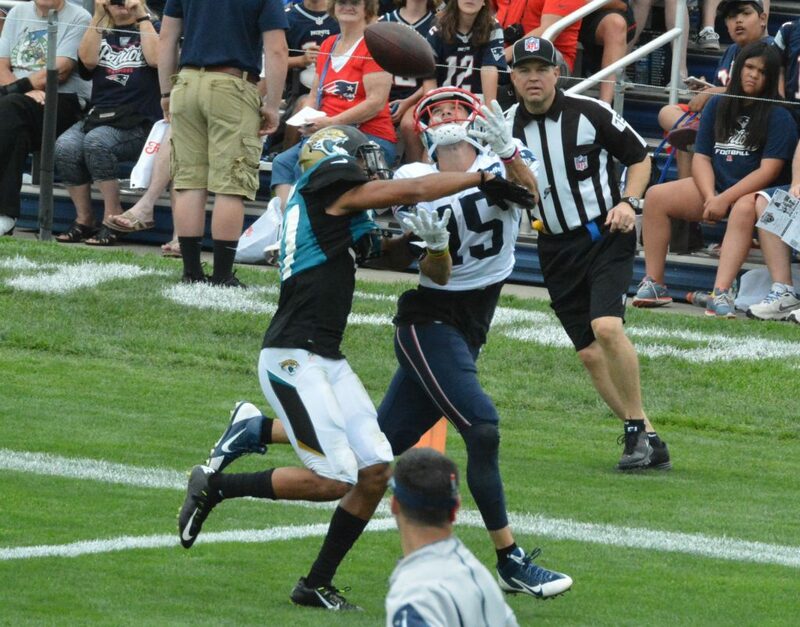 This entry was posted in 2017 Patriots Training Camp, Patriots Commentary, Patriots News and tagged 2017 Patriots Season, 2017 Patriots Training Camp, 53 Man Roster Projection, Allen Hurns, Allen Robinson, Bill Belichick, Blake Bortles, Chad Henne, Chris Hogan, Danny Amendola, Dion Lewis, Dont'a Hightower, Doug Marrone, Jacksonville Jaguars, James White, Jimmy Garoppolo, Julian Edelman, Malcolm Butler, Marqise Lee, New England Patriots, NFL, Patriots, Patriots edge rushers, Patriots Training Camp Photos, Rob Gronkowski, Tom Brady, Trey Flowers on August 10, 2017 by Steve Balestrieri. The Patriots take on the Jacksonville Jaguars Sunday afternoon at 1:00 p.m. at Gillette Stadium and then get an early bye week before jetting off to important road games in Dallas and Indianapolis. Jacksonville is somewhat of an unknown quantity in New England, the two teams don’t play much and the Jags, in a rebuilding mode don’t get a lot of national exposure. Many fans from outside the area would be hard-pressed to name more than a few of their players. But Gus Bradley is making some good strides there and is putting together a good, young roster. They’ll be attempting to shock an AFC East foe for the second week in a row. New England comes in as heavy favorites and should win this game, but games aren’t played on paper. They’ll need to get a good effort for the entire 60 minutes this week before heading off for an early vacation week. Malcolm Butler: The second-year player from West Alabama has been playing well as the starting left corner thus far in 2015. He and Tarell Brown have given the Patriots solid play overall in the secondary. 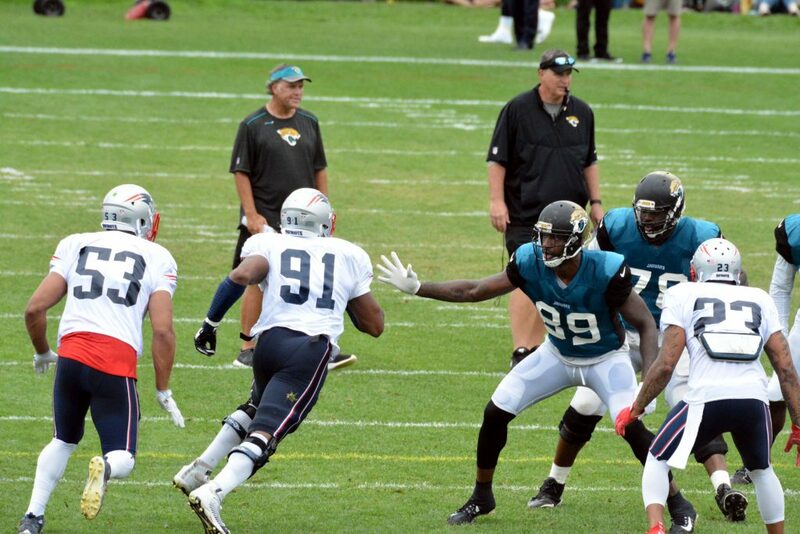 Butler will probably face-off against WR Allen Robinson a lot this weekend. The Jaguars have a trio of young talented receivers in Robinson, Allen Hurns and Marquise Lee. And they’ll be looking to use play-action to take shots down the field. Robinson has had a bit of a coming out party against the Dolphins last week, catching 6 passes for 155 yards and two touchdowns. The 6’3 WR from Penn State is rapidly becoming a favorite target for QB Blake Bortles. He made three big plays last week in the first half with catches of 36, 52 and later a 46-yard touchdown. Butler will be the first line of defense for the Patriots defense; a strong game from him, contesting every throw and playing tight coverage will be a big step in making Bortles look elsewhere and therefore increasing the chances of making a mistake or holding the ball too long and getting pressure on him. Butler had another, highlight reel interception last week against Buffalo; He showed great concentration in diving for a tipped ball and coming up with it. He’s now one of the most indispensable players on the Patriots defense. Dont’a Hightower: The Patriots linebacker showed up on the injury report this week with a shoulder injury that immediately gave everyone pause. He had shoulder surgery in the off-season immediately after the Super Bowl and missed all of the spring workouts. But this week, the Jaguars will be looking to limit Tom Brady’s chances of scoring and the best way to do that is to keep him on the sidelines. The Jaguars running back position is beset by injuries with Toby Gerhart and Dennard Robinson banged up but rookie RB T.J. Yeldon will be a big factor in this one. Yeldon carried the ball 25 times last week as the Jaguars stayed balanced with 33 runs and 33 passes. They’ll be looking to do more of the same, with the Patriots giving up a whopping 5.7 yards per carry thus far in 2015; Yeldon will be their go-to guy. This is where Hightower’s value comes in. The big linebacker is always quite adept at shooting the A-gap and putting pressure on the QB or blowing up plays in the backfield. And slowing Yeldon before the big back can get up a head of steam is of paramount importance this week. Hightower can also factor in the pass rush as well. After giving up five sacks in the opener, the Jags offensive line allowed none against the Dolphins. Facing a big quarterback in Bortles that likes to extend plays with his feet, Hightower along with Jamie Collins shooting the A-gap may be a way to force the Jaguars into making mistakes. 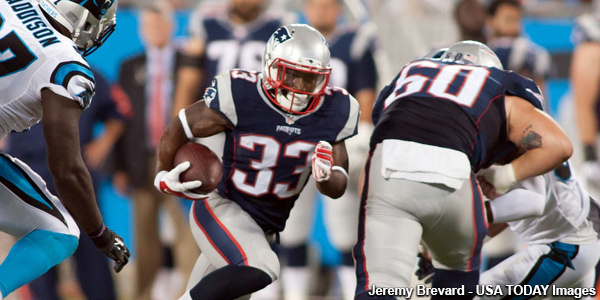 Dion Lewis: The diminutive running back has been very impressive and has been the surprise story of the season so far in 2015. He followed up a good showing in the opener against the Steelers with an even better one in Buffalo last week. He had a combined 138 yards rushing and receiving against the Bills including a 6-yard touchdown run in the first quarter. One question this week will be whether or not the Patriots share the wealth and snaps between Lewis and LaGarrette Blount or does Bill Belichick ride the hot hand of Lewis and allow him to continue to get the lion’s share of the work in the backfield? Lewis could be a big factor again this week; the Jaguars have been vulnerable to the tight ends catching the ball the past few years and may have to put a lot of resources to the task of slowing down Rob Gronkowski and Scott Chandler in the passing game. That could once again open the door for Lewis to get some mismatches on linebackers in coverage, something that QB Tom Brady has been quick to identify and take advantage of, thus far in 2015. Lewis has been compared to a combination of Kevin Faulk and Danny Woodhead this season which is pretty heady company. Entering this season, a big question was who would replace Shane Vereen’s production on third downs in 2015? So far, Lewis is not only doing that, but adding in some production on first and second downs as well. Stay tuned to PatsFans.com as we’ll have the latest on breaking news for the Patriots as well as a complete breakdown of the game on Sunday. This entry was posted in Patriots Commentary, Patriots News and tagged 2015 NFL Season, Allen Hurns, Allen Robinson, Bill Belichick, Blake Bortles, Buffalo Bills, Chandler Jones, Danny Amendola, Dion Lewis, Dont'a Hightower, Gillette Stadium, Gus Bradley, Jacksonville Jaguars, Julian Edelman, LaGarrette Blount, Malcolm Butler, Marquise Lee, New England Patriots, NFL, Patriots, Patriots edge rushers, Pittsburgh Steelers, Rob Gronkowski, Tom Brady on September 25, 2015 by Steve Balestrieri. The New England Patriots return home to find themselves atop of the AFC East with the Jets at 2-0 after their big win over Buffalo. They host the Jacksonville Jaguars at Gillette Stadium on Sunday afternoon, with the kickoff scheduled for 1:00 p.m. The game will be televised locally by WBZ-TV on CBS and will again feature Kevin Harlan and Rich Gannon to handle play-by-play and analyst duties. They covered last week’s game in Buffalo. The Patriots won a much anticipated matchup against the Bills last week 40-32. Tom Brady passed for 466 yards and three touchdowns and needs only one more to break the 400 TD Pass plateau. New England would love to head into the bye week at 3-0 and then have two weeks to prepare for the Dallas Cowboys. The Jags upset the Miami Dolphins 23-20 last week evening their record at 1-1. WR Allen Robinson caught 7 passes for 155 yards and two touchdowns. It was a huge win for a franchise that struggled mightily out of the gate in both 2013 and last season. Gus Bradley is slowly turning the corner with this young team that still has a long way to go. Series History: The Patriots and Jaguars don’t have a lot of history of playing one another having only met 10 times since 1995, but four of those games have been in the playoffs. The Patriots hold an overall advantage of 9-1 in those contests, having won all six home games against the Jaguars. 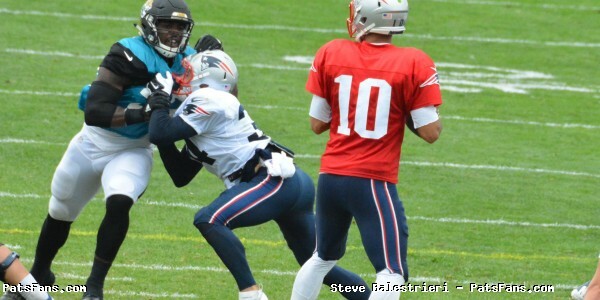 The teams last met in 2012 with the Patriots edging the Jags 23-16 in Jacksonville. 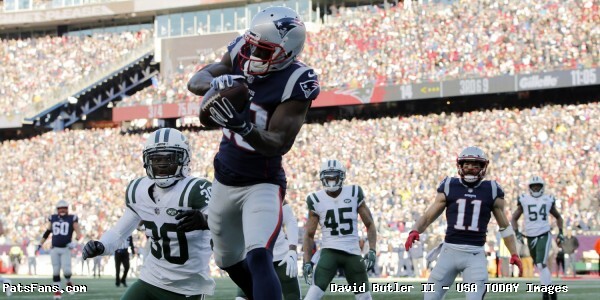 This entry was posted in Patriots Commentary, Patriots News and tagged 2015 NFL Season, Allen Hurns, Allen Robinson, Bill Belichick, Blake Bortles, Chandler Jones, Dan Skuta, Danny Amendola, Jacksonville Jaguars, Jared Odrick, Julian Edelman, LaGarrette Blount, Malcolm Butler, Marquise Lee, New England Patriots, NFL, Patriots, Patriots edge rushers, Rob Gronkowski, Rob Ninkovich, Sergio Brown, T.J. Yeldon, Tom Brady on September 24, 2015 by Steve Balestrieri.